The costs are staggering. “In the coming decades, mental illness will account for more than half of the economic burden of all chronic diseases, more than cancer, diabetes, and chronic respiratory diseases combined…. It’s trillions of dollars,” said Kramer. From an employer’s perspective, the need for a successful strategy to deal with mental illness in the workplace is clear. But what are the most effective ways to confront this challenge? Roundtable participants discussed a wide range of ideas and success stories aimed at de-stigmatizing mental health and incorporating the issue into wider conversations around talent, productivity, and inclusion. Model from the top. Carol Glazer received a standing ovation at the luncheon for her account of her own experiences with Post-Traumatic Stress Disorder (PTSD). This type of executive-level modeling sends a powerful message that a company is committed to improving mental health for all employees. Lori Golden shared how EY had experienced great success with a program where top-level managers host office-specific events and share stories of mental illness or addiction that they are personally connected to – either about their colleagues or loved ones or, in a surprisingly high number of instances, about themselves. Senior leadership setting the example conveys that this is a forum in which employees can feel comfortable sharing. Be flexible. Accommodating [the fact that people live busy, complex lives] gets you better buy-in…and keeps production pretty high,” suggested Dr. Copeland. A representative from one Council company concurred, explaining how their company has recently instituted a new policy of paid time off for caregivers on top of federally-funded leave. “Being in a culture in which we measure what you produce and not whether you show up in person all day, every day, and where if you can’t be there, you negotiate how the deliverables will get done and in what time frame…is immensely helpful to people who themselves have mental illness issues or addiction or are caring for those who do and may need some flexibility,” summarized Lori Golden. 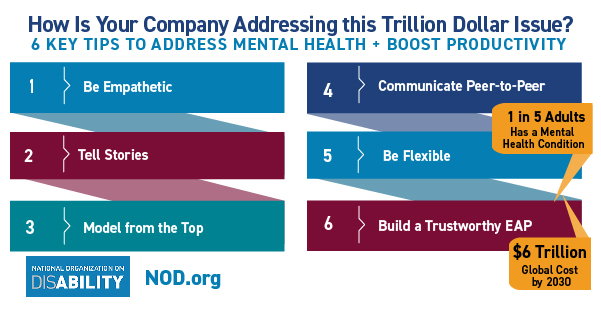 While revealing and accommodating mental illness remains a massive challenge in the workplace and beyond, a number of successful strategies are emerging for tackling this challenge – many of them pioneered by companies in NOD’s Corporate Leadership Council. Login to the new Corporate Leadership Council Members’ Only Portal to access exclusive resources and toolkits about mental health in the workplace. Click the LOG IN button on NOD.org to get started! Need help logging into the Members’ Only Portal? 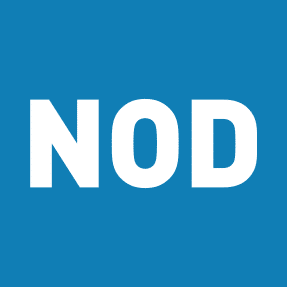 Contact us at council@nod.org.